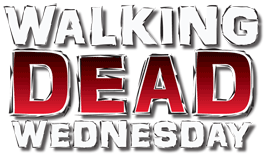 Walking Dead Wednesday is all about adding diversity. There is a (not unfounded) joke that AMC's The Walking Dead has a "one in, one out" policy when it comes to black characters - the men, at least. In order for a new one to be introduced, the existing one has to be written off in one way or another. It's improved (minorly) in recent seasons, but Series 4 of the Mystery Minis seems to be doing its part to combat that imbalance: a third of the characters are black. We begin with Morgan, Walking Dead's original Only Black Man. He appeared in the first episode, introducing Rick to the new world in which he'd awoken, then was left behind at the end of the pilot with a promise that they'd keep in touch. Spoiler alert: they didn't. And when he showed up again in Season 3, he actually called Rick on it. Then he was gone from the show again until Season 5, when he seemed a bit more sane. This is Sane Morgan, after his training with the cheesemaker. He's got his walking stick/primary weapon, and is wearing a tan jacket and khakis. He has fingerless gloves, though two of the fingers on his right hand have missed their brown apps, making it look like he's only got one finger. He's wearing the remnants of the riot gear Rick gave him from the police arsenal - basically just the shin guards, but they're recognizable. 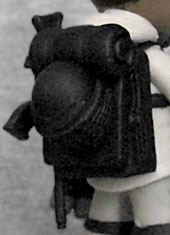 His backpack is highly detailed, with a bedroll on top, a knife on one side, and an automatic rifle on the other. Plus, the helmet from the riot gear is slung against the back! Too cool! 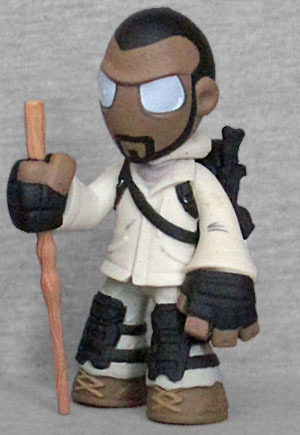 Morgan is one of the 1:12 figures, but he also has a 1:36 variant - that one has his hood up and a mask on, as he was first seen in Season 5. He's more often shown like this, though. Marvel Zombies: who started the plague?